A virtual exhibition on the history of the search for the Northwest Passage and its economic and ecological repercussions is now open on the Rachel Carson Center’s Environment & Society Portal. 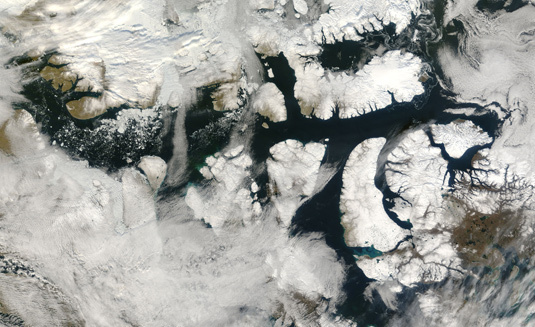 The Northwest Passage poses a serious challenge even to modern navigators. Some 1500 km long, the Passage connects the North Atlantic with the Pacific Ocean via a contorted route that threads between the islands of Canada’s Arctic Archipelago. The online exhibition on the RCC’s Environment and Society Portal covers the long and often tragic history of the seaway from a variety of angles. As well as elucidating the grounds for the fascination exerted by the very idea of the existence of a Nordwest Passage, the exhibition describes the topography of the corridor, its economic significance and the complex issues of sovereignty which its exploitation raises. It also focuses on the people who live along the route, and on the potential impact of the search for natural resources in this ecologically fragile system on their environment and way of life. Utilizing a variety of media, including historical maps, paintings, photos and videos, the exhibition presents a wide-ranging portrait of the Northwest Passage. Users can also follow the history of the discovery of the route by means of an interactive timeline that extends back for more than 500 years.